If you’re looking for a Brisbane carport that’s a little different to anything else in your street, it’s time to think outside the square… And find a Brisbane carport builder who’ll want your carport to be as special as you do! One potential idea is to create a carport with a curved roof. These sophisticated and modern structures generally feature polycarbonate roofing sheets, but products like Colorbond can also be used (as seen in the feature image). A curved roof Brisbane carport wouldn’t just be a fashion statement. They are strong and durable and can withstand our tough Australian conditions. What’s more, they provide one advantage of many conventional roofs, and that’s the space underneath. If a curved roof carport is going a step too far for you, then perhaps a Dutch gable roof (also pictured on this page) is more your style. They’re not rare – indeed they could be termed popular – but they are arguably more stylish than any other roof type and certainly have a wow factor. They are a little more costly to build than other roof styles, because of the extra framing required, which is why you don’t see more Dutch gable roof carports. A boxed-in frame carport with rendered finish could be just the ticket if you have a modern house, particularly if your house is also rendered. With plaster ceilings, downlights, and hidden guttering, downpipes and wiring, these carports are clean and stylish. 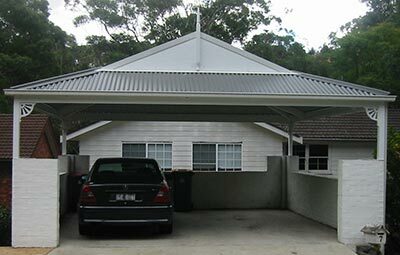 A great option if you want your carport abutting the street is to include a panel or roller door on your Brisbane carport. Security is a big benefit and if you add a remote function you’ll be the envy of the street! If your carport is adjoining your house, consider using extenda brackets. These brackets allow the carport roof to attach to your home’s existing roof, rather than the fascia, allowing you to raise the roof a lot higher than otherwise could be achieved. This could be particularly handy if you have a boat or caravan. When you’re ready to think outside of the box, give Mr Carports a call on 1800 557 782. You can also look at Brisbane branch page for more ideas.